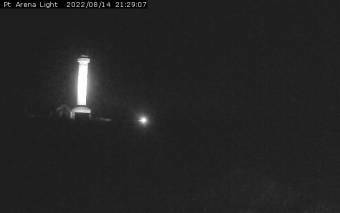 It's 02:16 in Point Arena, USA right now. Point Arena Lighthouse Set in one of the most spectacular yet peaceful surroundings on the northern California coast, the Point Arena tower is the only Pacific West coast lighthouse of significant height (115 feet) that you can climb to the top! Guided tours of the light station as well as self guided tours of the grounds are available daily. Afterward, spend some time browsing through our Lighthouse Gift store, a shop featuring unique souvenirs, interesting gifts, custom made Abalone Jewelry, beautiful collectibles, and lighthouse clothing. Guerneville, California: Stumptown Brewery, 50.8 miles away. Shelter Cove, California: Headlands Cam, 75.9 miles away. Petaluma, California: Kenilworth Junior High School, 77.7 miles away. Petaluma, California: Park Place, 77.7 miles away. Garberville, California: Garberville Airport, 79.2 miles away. Williams, California: Williams (SB), 86.5 miles away. Fairfax, California: East Fairfax, 91.3 miles away. Sausalito, California: Sausalito Yacht Club, 101.6 miles away.